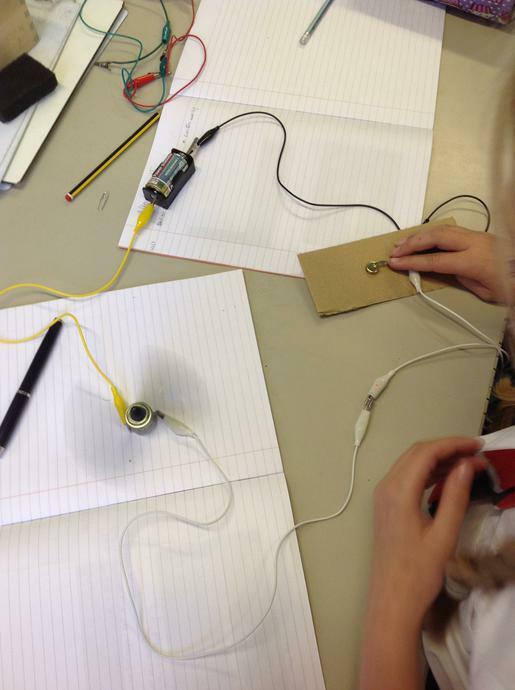 This term, we are focusing on forces. We experimented with gravity and centripetal force by swinging around a bucket with water in it. This helped us to understand how different forces can become stronger and cause different outcomes. When we swung the bucket fast enough, the centripetal force allowed the water to travel in a circular motion and therefore not fall out of the bucket. When we slowed down, we got wet! This was because the gravatational pull had now taken over as the stronger force. In science during term 5, we have focused on inheritance and evolution. In order to understand how camouflage is an extremely useful adaptation, we went to the nature area to look for different coloured 'worms.' The red, yellow and blue ones were easy to find; the brown ones proved very tircky. We also discovered that there were double the amount of brown worms as the other colours and discussed why this would be. The conclusion we drew were: they were better hidden from predators and therefore were able to reproduce. Their offsrping would inherit their coluring, meaning that the worm popultaion was likely to become more brown and eventually the other colours may die out. Our topic for term 4 has been all about the human heart and circulatory system. We started off, by creating a large scale version of the circulatory system in the classroom! Different children were the heart, lungs and other parts of the body. The rest of the class had little pieces of paper that were red on one side (oxygenated blood) and blue on the other (doexygenated blood). The 'blood' travelled through the heart, to the lungs to become oxygenated, delivered this to the body and returned with carbon dioxide, for the process to repeat. We investigated whether there was a relationship between the type of exercise you do, and the rate of your heartbeat. We took part in different types of exercise, and took our pulse before and after each one. We found out that the more vigorous the exercise, the faster your heartbeat, and realised this was because your heart needed to pump the blood (and oxygen) faster around your body, to keep it working. This time, we learnt all about blood. We learnt about the main components of blood: red blood cells, white blood cells, platelets and plasma, and which part did which job. We then made our own models of blood, thinking carefully about the ratio of each part, so that it was an accurate representation. We used red skittles, white marshmallows, hundreds and thousands and water. Can you figure out which object represented which component? 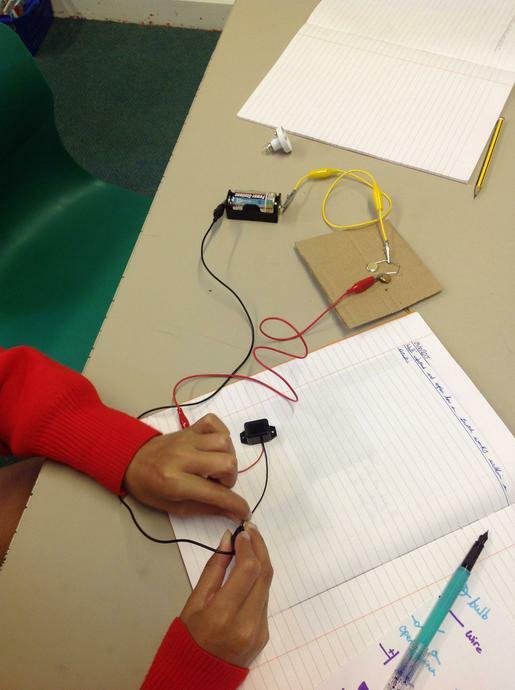 This term, we are focusing our learning in science on materials and their properties. 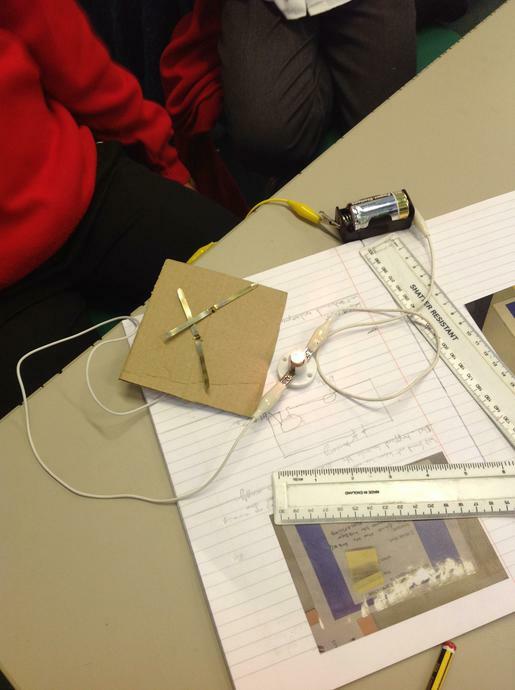 We have learnt about electrical thermal conductors and insulators: thermal conductors let heat through, whereas thermal insulators stop the heat. We have also studied how to separate different mixtures. We used filtration to separate a mixture of soil and water. To do this, we used filter paper. The aim was to get the water as clean as possible! We also thought about how evaporation can be useful to us, using heat from a hob to evaporate the water from a sugar and water solution. This left sugar crystals in the bottom of the pan. We investigated which was the best thermal conductor by using 3 different spoons, hot water and butter! Each spoon was put into a bowl of hot water, with butter on the end of it. The spoon on which the butter melted quickest, was the best conductor. 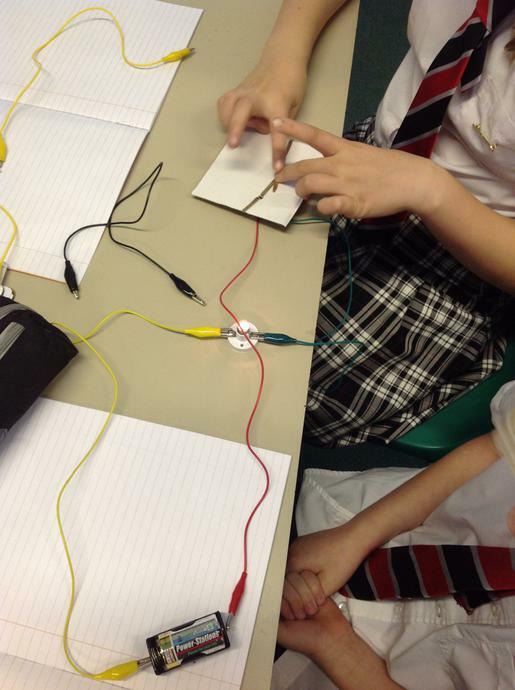 Then, we learnt about insulators, by asking the question: what happens if a snowman wears a coat? We covered a frozen balloon with fabric to represent our snowman, and left another one uncovered. After a while, we observed the balloons to see whether they had melted or not. We used two mugs of hot water to represent people, again covering one and leaving the other uncovered. After a while, we were able to compare the temperature of the water, to see what affect the 'coat' had on it. Surprisingly, the 'snowman' with the coat on, stayed frozen, as the insulator had stopped the warm air getting in, whereas the uncovered one melted. The 'person' with the coat on was far warmer than the one without at the end too. 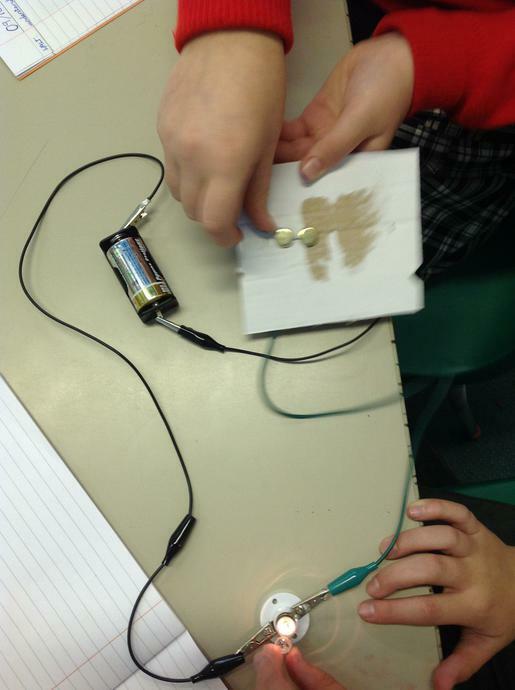 Our learning in Science in term 2 is all about sound. 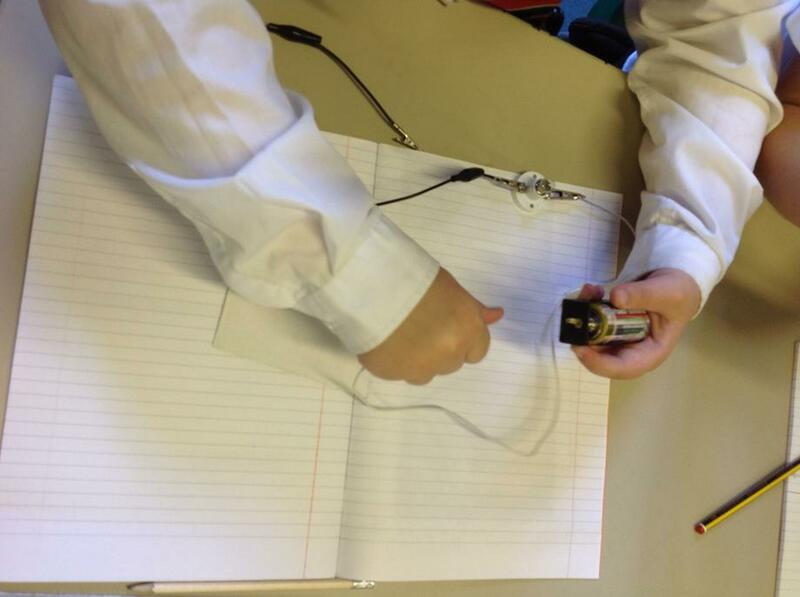 This week, we learnt that sounds are caused when something vibrates. We explored this concept by carrying out 4 different observations: scratching a balloon next to our ear, 'twanging' a ruler, plucking a guitar string and playing a triangle. 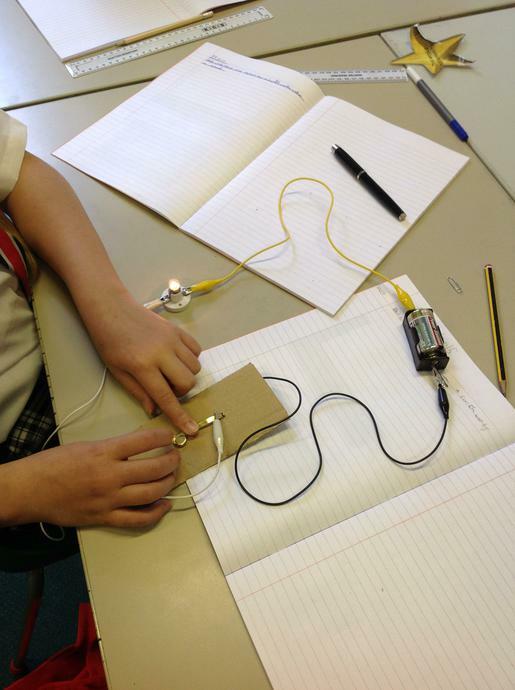 We have been learning all about Electricity this term. 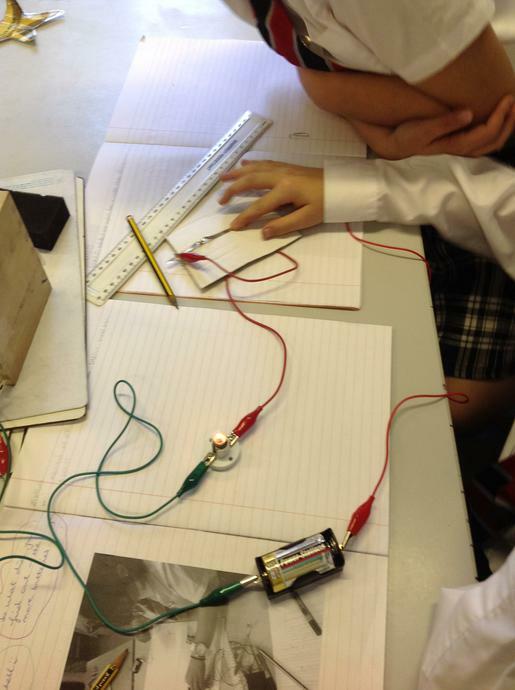 We know that electricity is a flow of particles called electrons, that are given the energy to move by a power source. 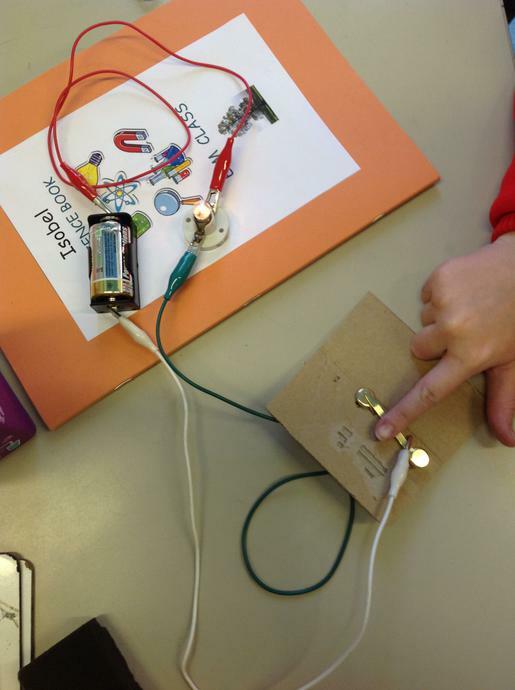 We learnt about switches and how they can be used to complete and break a circuit - which means we can turn things on and off. 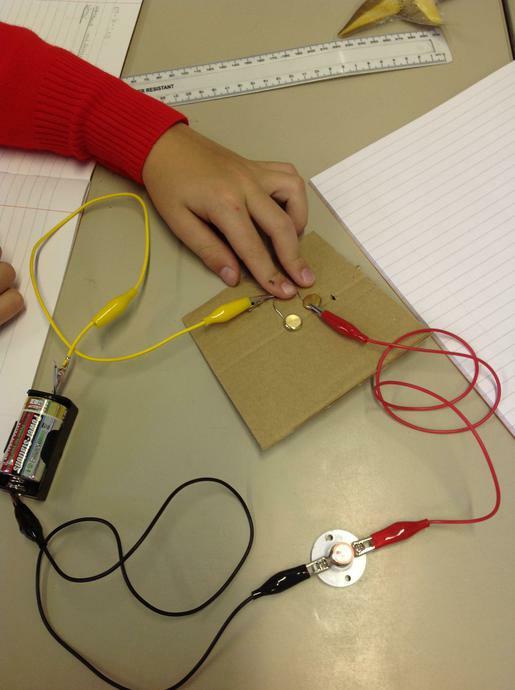 We then made our own, and tested that they worked using electrical components such as bulbs, buzzers and motors.